This Middle Eastern-inspired dip is traditionally made with aubergines - why not try this for a change? Preheat the grill to high. Place the courgettes on a baking sheet lined with foil and grill, turning frequently, for at least 30 minutes until charred and black. Remove from the heat and leave until cool enough to handle. Carefully scrape most of the burnt skin away with a spoon and place the flesh in a sieve to drain for 5 minutes. Give the flesh a good squeeze with your hands to get rid of any excess water. Tip the courgette flesh into a food processor, add the tahini, yogurt, garlic and lemon juice. Blitz until smooth and creamy, season and tip into a shallow bowl. Alternatively, mash everything together thoroughly with a fork. 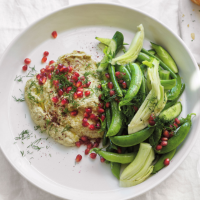 Sprinkle the baba ganoush with dill, pomegranate seeds and sumac. Serve immediately with strips of warm pitta or seasonal vegetables cut into strips. This recipe was first published in Wed May 20 10:31:57 BST 2015.